Synopsis, Our Opinion: A wine with lots of positive attributes and one we would buy again in a flash. Producer/Winery: Henri Bungener; Domaine Le Clos de Caveau; Vacqueyras, France. 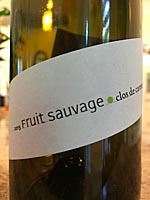 Grape Variety: Southern Rhone blend – 60% Grenache and 40% Syrah. Geographic Appellation, Region, Country: Vacqueyras; Rhone, France. Paired With: Venison meatloaf, baked potato with butter and fresh chives and peas. Opened one hour before drinking. Purple-garnet color with the same color rim. Plum, cherry and damp earth aromas. Smooth, vibrant, spicy, but on the sweet side with a medium body (but, as we sipped we kept saying it behaved more like a full body wine) and a 150-grit texture. Earthy plum, cherry, blackberry and current flavor. Plenty of fresh acidity, round-edged slightly grippy tannins and a long dry, fruity finish that was mouth-puckering. A Rhone blend that went perfectly with the strong flavors of the venison meatloaf. A wine with lots of positive attributes and one we would buy again in a flash. Comments: Learn more about Domaine Le Clos de Caveau and their wines. Imported by: Barrique Imports’ Seattle, Washington.